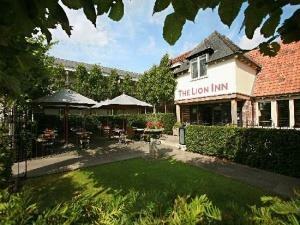 Group Eating Out at The Lion Inn01245 394900work Group Eating OutIt’s all in the name! Big comfortable bed, crisp white linen and fully equipped ensuite are just a few of life’s little necessities away from home. We haven’t forgotten to add a flat screen TV, complimentary internet access with space to work as well as air conditioning you control! Tea and coffee are provided as you would expect. It’s all in the name! Big comfortable bed, crisp white linen and fully equipped ensuite are just a few of life’s little necessities away from home. We haven’t forgotten to add a flat screen TV, complimentary internet access with space to work as well as air conditioning you control! Tea and coffee are provided as you would expect. A number of our rooms have balconies overlooking the guest garden whilst others have direct access to the garden via their very own terrace. Take A12 motorway, leaving at junction 19 Boreham Interchange. Follow signs for B1137, The Lion is situated on the right as you enter the village. Free parking including disabled available.